Karen is very upset that Diana’s gone. Mack is sure that Chip killed Ciji, and they put out an APB for them. Val is dogged by reporters. A “mystery man” helps her escape them. Abby is mad that Mitch is still defending Gary. He tells Abby that she can’t fire him, as Gary is his client. Gary’s mad and says he can’t trust Abby. On the stand, Janet admits that Gary was charged because of the way he worded his statement, and that there are other suspects. The judge drops Gary’s charges and releases him. Ecstatic, Gary looks around for Val, catches her eye and smiles at her. Abby sees this and quickly hugs him, but Gary continues to smile at Val. NOTE: As the 1983-1984 season begins, there is new theme music, but the title sequences are the same. There are some new faces to the cast as well. The first is the reporter that helps Val, Ben Gibson, played by Douglas Sheehan. The second is Barry Primus, who took over Edward Bell’s role as Mitchell Casey. Gary is finally out of jail and mack finds out that the real kiler was Chip. Val runs into her “mystery man” Ben Gibson while jogging on the beach. He admits he doesn’t jog, and was just doing it to meet her. They go to dinner, but Val leaves when she learns he’s a reporter. Gary buys a ranch and tells Abby he wants her to move there with him. She’s mortified. Mac has the FBI help find Diana and Chip. On the road, Diana pays for gas with her credit card. At a motel, she sees a news story about Chip and is unnerved. Chip starts to cry and tells Diana that he slept with Ciji before he met her. He says Ciji was going to tell Diana she was pregnant to break them up. Chip said he was scared he would lose her, so he and Ciji got into an argument and that he hit her, but didn’t mean to kill her. He claims it was an accident, but that he did it so he and Diana could be together. NOTE: Ben Gibson, the mystery reporter, reveals his love for Val in this episode. Gary buys the famous ranch that will be his home for the next few seasons. Diana tells Karen that Chip killed Ciji for her. Karen says she’ll testify, but Janet says they need Diana. Furious, Diana tells Karen she never wants to see her again, and moves to the ranch with Abby. Lilimae goes to see Chip, who laughs at her. She realizes he killed Ciji. Abby finds out that Gary will inherit 10% of Ewing Oil in 15 days and his divorce is final in 10, so she’ll have 5 days to marry him in order to get half of his inheritance. Abby finalizes the papers on her subsidiary, “Apaloon Corp.” She asks Laura to check out an apartment building that her uncle left her. Gregory Sumner, a candidate for the Senate, is an old friend of Mac’s, and asks him to be part of his team. Val doesn’t ask for money at her and Gary’s divorce settlement. Val sees Ben, who explains he doesn’t want a story, but wants to get to know her, and they agree to be friends. NOTE: William Devane joins the cast as Senator Gregory Sumner in this episode. Gary and Abby go to Greg’s fundraiser and Gary donates money to him. Val and Ben are there, and she introduces Gary and Ben. Greg asks Mac to head up his crime commission. Karen and Eric go to the ranch to see Diana. Diana goes off on Karen, and Eric slaps Diana. Lilimae tries to convince both Chip and Diana to testify that he killed Ciji, because he has to pay for his crime. Janet tells Lilimae that since Chip won’t confess and Diana won’t testify, they don’t have enough to hold Chip and he’ll be released the next day. Lilimae decides to try and talk to him one last time, and brings Karen to talk to Diana. As they pull up, Chip has already been released and is talking to reporters. Lilimae revs the gas and hits Chip with her car. NOTE: Lilimae takes the matter into her own hands when she hits Chip with her car. Lilimae is arrested, and Gary wants to pay her bail. Val says no, she’ll pay it. Chip is rushed to surgery. He wakes up, but later goes into a coma. Diana blames Karen for running him over. Laura tells Abby that the apartment her uncle left her at Lotus Point was left to Sid, too, so Karen owns half. Abby instructs her to buy Karen out, but Karen won’t sell. Abby suggests to Gary they get married. He says he wants to wait. Lilimae bursts into Gary and Abby’s bedroom, looking for Diana. Abby says if Gary brings her home, she’s leaving. Gary takes Lilimae home anyway. Val’s upset, so Gary comforts her and they sleep together. When he gets home, Abby’s leaving. Val tells Mac she slept with Gary and is happy. Gary tells Laura about it and says how it’s great that they can be friends with no strings. Val has a psychiatrist, Dr. Bovane, see Lilimae. NOTE: The development “Lotus Point” is mentioned for the first time in this episode. Val sleeps with Gary (which explains why she became pregnant with his children, which will be another infamous storyline). Eric goes to the hospital and tells Diana that he’s glad that Sid isn’t around. He reminds Diana that Sid died in order to bring someone to justice, and would be disgusted with her. Diana tells the police that she will testify. Laura tells Gary that he is to Val as alcohol is to him, and that if he doesn’t have plans to get back together with her, he needs to leave her alone, as stringing her along is cruel. Gary tells Abby he’ll marry her, and they do. Dr. Bovine suggests that Lilimae be put in Lakevail Sanitarium. At Lakevail, Lilimae begs Val not to leave her there, and they both cry. At home, Val calls Gary for support. Olivia answers and tells Val that Gary and Abby are on their honeymoon. At the hotel, Gary orders room service. The waitress looks exactly like Ciji, and Gary is dumbfounded. NOTE: After a ten episode break, Lisa Hartman returns to “Knots Landing” as a new character, Cathy Geary. She joins the cast in this episode. Gary marries Abby in this episode. It’s ironic that Lisa Hartman would originally played a character named Ciji ( C.G. ) and would return as Cathy Geary whose initials are C.G. (or Ciji). Val tells Ben about sleeping with Gary. Ben is upset and leaves. Karen’s still upset over Diana and is having back pains. Mac convinces her to go to the Doctor, and she gets pain pills. Gary finds out that the Ciji look-alike is Cathy Geary, and he follows her. Abby tells Westmont that she is going to develop Lotus Point, and buys the apartment’s management, H & O Management so she can continue to send Karen checks, and Karen will never know. Laura gets Westmont drunk to see what Abby’s up to, and he tells her about H & O. Gary receives his inheritance. Diana gives a deposition that Chip ‘accidentally’ killed Ciji, but then he wakes up from the coma. The police handcuff him to the bed. The police decide to move Chip to County Hospital, but when they go to his room to get him, he’s gone. NOTE: Karen begins a drug problem when she begins taking pain pills. Chip is arrested in his hospital bed and then escapes soon after. Mac visits Tom Jessick, an attorney friend that he sent to jail and says he wants him on the crime commission. Greg’s at the McKenzie’s and his daughter Mary Francis comes by, angry that he forgot to pick her up. Karen invites Mary Francis to stay with them. Police patrol the ranch for Chip. Cathy tells Gary that she thought he might be someone her ex-husband Roy sent to find her. Gary invites Cathy to live and work at the ranch. Abby finds out she’ll need a coastal variance to develop Lotus Point, and asks Greg for help. They sleep together, and he says that a member of the coastal commission will meet with her. Laura tells Abby she knows about H & O, but won’t tell Gary for a piece of the action. Val makes a romantic meal for Ben. She gets mad and leaves when he assumes she will sleep with him. Later, she goes back, and she and Ben make love. Gary buys Cathy a dress like Ciji’s and brings her to get her hair cut like Ciji. He also has her lip sync to Ciji’s album. Laura walks in and is angry. Gary says he’s doing it because he couldn’t help Ciji, but now he has a chance to help someone else. Mary Francis walks in on Greg and Abby, and is upset. She and Eric kiss. Mac tells Karen she’s using Mary Francis to replace Diana. Karen continues taking pain pills. Mac is on to something and Tom Jessick is the link. Some men meet with Sumner and tell him to drop Mac, because he’s getting too close. Ben goes with Val to bring Lilimae home, against Dr. Bovine’s wishes. Diana brings chicken to the barn at the ranch, where Chip is hiding. NOTE: Chip hides out in Gary’s ranch. Mac questions Tom about whether a lawyer named Cavanaugh is the head of the Wolfbridge group. Mac wants Tom to go back to them as an ‘inside’ man. Gary asks Cathy to sing for him. She gets upset and tells him she’s not Ciji, and never will be. Greg gives Abby the coastal variance she needs. They begin kissing, and then notice that Laura is watching them. Val is worried because Karen is acting so strange. Karen tells her she’s tired, and continues to take more pills. Detective Nick Morrison posts a policeman on the ranch. Chip tells Diana they need to leave the next day. Diana goes to meet Chip. Chip is hiding in the stable. Cathy walks in. Chip is dumbfounded, thinking she’s Ciji. Frightened, he scrambles to get away from her, and falls on a pitchfork. Police and Diana run to the stable when they hear Cathy screaming. Chip’s dead. NOTE: Michael Sabatino makes his last appearance in this episode as Chip dies. Tom tells Mac that Wolfbridge is bigger than he thought, and later calls Mac from the bus station and says he’s leaving town, because it’s not worth giving up his life. Chip’s sister Angie comes to town for Chip’s funeral. Angie tells Diana that Chip’s a louse, and Diana’s only 1 in a long line of women that Chip used and threw away. Diana slaps her. Abby talks to Diana and says first loves never last. Diana angrily responds that it wasn’t a schoolgirl crush, it was her husband who died. Greg tells Abby that she’s telling Laura too much. Abby tells Laura to lay off, because she’s a master at the game Laura’s just learning to play. Val tells Mac that Karen’s in trouble with her pills, and Eric concurs. Karen overhears them and screams at them all that she doesn’t have a problem. Jane Sumner comes to town, so Greg can’t pay attention to Abby. Mac asks Greg to help him find Tom Jessick. A man tells Greg to get rid of Mac or they’ll drop his campaign. Cathy goes to Abby and says she wants out of their deal for her to impersonate Ciji, because she doesn’t want to hurt Gary, but Abby won’t let her. Val and Mac are concerned about Karen. Val finishes her book “Nashville Junction” about Lilimae’s life. Ben asks Val for more of a commitment. Then Val finds out she is 3 months pregnant with Gary’s baby. NOTE: In this episode, we meet Greg’s wife, Jane Sumner. Val announces that she is three months pregnant, but we all know who the father is! Val tells Lilimae she’s pregnant, and Lilimae inadvertently tells Ben. Val admits to him that the baby is Gary’s, and Ben’s upset. Cathy and Gary kiss, but Gary says he won’t cheat on Abby. Mac tells Greg he has evidence on Wolfbridge. Mac’s office and the McKenzie home is ransacked. Laura offers money to the Marcus’s, to buy their property on Lotus Point, but they won’t sell. Mark St. Claire goes to see Abby and says that he represents Wolfbridge, and they will be her partners in Lotus Point. Abby refuses, and Mark says she has no choice. If she doesn’t cooperate, they will have her variance revoked. Karen ransacks Val’s bathroom looking for pills, and is so out of it, she doesn’t even notice her house has been trashed. Karen calls the Doctor and gets a refill. Mac finds Karen passed out in the shower with the empty bottle of pills beside her. NOTE: Val tells Ben that she is pregnant. Mark St. Claire makes his first appearance on this episode, and he turns out to be a dangerous person by the end of the season. Karen’s drug dependency goes too far by this episode. Mac has Karen admitted to a hospital chemical dependency program. Karen denies she has a problem .Abby is angry at Greg for getting her involved with Mark St. Claire. Mark tells Abby that the Marcus’s house has burned down, so Abby tells Laura to make them another offer. St. Claire tells Greg he has one more chance to drop Mac, or else he will give incriminating information to his opponent. Greg has a press conference and says that Mac abused his power and got a variance for Karen’s property on Lotus Point, and so he’s asked Mac to resign. Mac questions Karen about Lotus Point. She says she gets checks, but doesn’t remember anything else. Gary barges into Abby’s office and says he is going to have her books audited. Jane and Mary Francis apologize to the MacKenzies for Greg and go back to Sacramento. Jane berates Greg for making the election more important than friendship. Greg wins the primary race. Abby and Westmont scramble to get Apaloon off of real estate documents. The audit goes well and Gary apologizes to Abby. Gary sees that Cathy makes much more than the other ranch hands, and that they are dated from before he met her. Gary hires a detective who says Cathy spent the last 4 years in prison. Ben and Mac discover that Apaloon owns all the property at Lotus point except for Abby and Karen’s apartment. They think Apaloon is a front for Wolfbridge. Greg and Laura sleep together. Karen suffers from withdrawal. Gary goes to see her and says if he could get through it, she can. Karen is outraged that he would compare her plight with his alcoholism. Karen finally opens up in group. Karen’s therapist wants Mac in on her therapy too. Mac feels they’re ganging up on him. Ben tells Val to tell people that the baby is Gary’s, as he’s tired of everyone bugging him about it, and he wants to be free of her. Gary finds out that Cathy was in prison for 2nd-degree murder. He asks Abby about it. Abby tells Cathy to leave and threatens to tell her ex-husband Ray where she is. Cathy counters that if she does, she’ll tell Gary that Abby hired her to distract him so she could steal him blind. Abby calls Ray. Greg breaks a date with Abby and sleeps with Laura. Mac goes to the DA who tells him that he might be disbarred. Mac goes to the Apaloon address and finds out it’s a mail service. Some guys beat him up. Ben tells Val he is taking a job in South America, and Val doesn’t want him to. They hug. Michael, Eric and Gary talk to Diana about making up with Karen. Finally, Diana and Karen make up. Mac has Eric drop off a bright orange mailer for Apaloon at the mail service, and then watches to see who picks it up. He sees Laura go in and come out with the bright orange mailer. NOTE: Ray Geary, Cathy’s ex-husband, makes his first appearance in this episode. Ben proposes to Val and says he’ll raise the baby as his own. She accepts.Cathy tells Gary that she killed a man in self defense (but she really took the blame for a murder that Ray committed). She says Abby hired her to divert him from her business dealings, but she fell in love with him. Laura tells the MacKenzies about Apaloon and Mark St. Claire. Mack barges into Abby’s office, but she denies knowing anything. She tells Westmont if Gary finds out and sues her she would win. She can claim he’s mentally unstable because he’s been trying to re-create Ciji, a dead girl. Greg gives a press conference saying Abby got the variance and re-instates Mac. Gary confronts Abby, who feigns innocence. He loses it and starts trashing the room and screams at her to get out of his life. Abby runs to Greg’s, only to find him in bed with Laura. Abby tries to talk to Gary, but he tells her to contact him through his lawyer. Gary freezes the assets of Gary Ewing Enterprises and seals the office. When Val is overcome by pain from her pregnancy, her doctor forbids her to accompany Ben to El Salvador. After Abby orders Cathy off the ranch, Gary tells Cathy that she may stay as long as she wishes. When Gary says that he intends to file for divorce, Abby says she doesn’t want a divorce. Later, Gary and Cathy consummate their relationship. When Mack resumes his job on the crime commission upon a request from the governor, Sumner becomes suspicious of Mack’s intentions. Val is upset as Ben leaves for El Salvador. She finds out she’s having twins. She gets a call saying Ben and 2 others were on their way to a rebel encampment and their jeep was hit and the men are missing. Cathy gives Ray $5,000 to leave, but he won’t. He grabs Cathy by the hair and Gary sees and beats him up. Ray say’s they’ll pay for this. Gary and Cathy sleep together. Mac, back on the crime commission, pretends he’s no longer going after Wolfbridge but tells Abby he’ll grant her immunity if she’ll help him go after them. Abby tells Greg. Mac tells Tom Jessick that Abby bought that he needed her help and has already probably told Wolfbridge. Gary has Abby’s assets frozen, and St. Claire tells Greg that it’s his problem to unfreeze them. Greg tries to get Gary to unfreeze his assets. Gary reports this to Mac who tells him to keep the assets frozen, as it will force Wolfbridge’s hand. Ray spies on Gary and Cathy. Gary tells Karen that if Abby cheated her, he will make it right. Val finds out that the other 2 men with Ben were found dead. She wants to go to El Salvador, but Karen says she will only be putting her babies at risk. Val’s upset and calls Gary, sobbing, who tells her to come out to the ranch. Mac drives out to the ranch and is talking to Gary when a shot rings out. Mac calls Karen and tells her that Gary has been murdered. Just then Val drives up. when she and Gary were seeing each other, Gary only married Abby so that Val would go on with her life. So he married Abby because he loved Val, not Abby. As the funeral begins, Morrison asks Cathy to come downtown for questioning. At the police station, Cathy goes into a room and Gary’s there – ALIVE – and they start to kiss. Ben comes home and Val cries with joy. The hitman actually shot Ray, not Gary. Cathy calls Ray’s mom to tell her, and Laura overhears. Laura tells Greg, who asks Karen why none of the Ewings came to Gary’s funeral, and tells St. Claire that he thinks Gary is still alive. Abby mourns for Gary. Greg tells Abby to sell Lotus Point to Wolfbridge, but she won’t. Greg tells St. Claire that he is through dealing with him, and calls Abby to tell her Gary’s alive. Ben figures out what Mac is doing, and is furious with him because Val could have lost her babies. Ben punches Mac. Abby goes to the MacKenzies and tells Karen that Gary’s alive and Mac is using him to get to Wolfbridge. Karen feels very betrayed and confronts Mac. She’s upset at all the pain he has caused and tells him their marriage is over, and gives him her wedding ring back. A man tells Val that Gary is alive and that she will be receiving a call from Mark St. Claire, but if she mentions the conversation, Gary will be killed. Ben tells Val that Gary is dead. Karen tells Val that Gary is alive, but kidnapped. Val confronts Ben, who says he was happy when he thought Gary was dead, because he’s tired of her being in love with him. Val breaks up with him. Mac has Gary stashed away at the Bel Mar motel, and brings Abby to see Gary. Gary’s mad at her and doesn’t like Mac’s plan as it depends on Abby. Mac says he has no choice. Greg calls a press conference and says that he found out Wolfbridge is a criminal organization, and gives credit to Mac. Greg says he will sever all ties with them. Mac tells Abby he is going to wire her, and will bring Gary out to the lobby at 3:30 so that St. Claire will have a chance to shoot Gary again. Abby needs to get him to say something that will link him to the assassination attempt and then get away from him as fast as she can. Abby goes to see St. Claire, and tells him that Gary’s at the Bel Mar. He then pulls the wire off of her and says she is going with him to the hotel. St. Claire calls Val and tells her to go to the hotel, and to get into Mac’s jeep which will be out front. He tells her that Gary will come out, and she needs to drive him away. St. Claire then calls Karen and tells her that he has planted a bomb in Mac’s jeep. Abby figures out that Karen will tell Mac not to get in the jeep because of the bomb. Then Gary will see Val in the truck, and run out to save her so St. Claire’s men will be able to have a clear shot at him. The hotel maid, who works for St. Claire, hides a gun in her cart, and goes to the lobby. Mac and Gary walk into the lobby. Karen runs in and tells Mac that there is a bomb in his car. Gary sees Val, and runs to her. The cleaning woman pulls out a gun and is about to shoot Gary, but Mac grabs her arm and she accidentally shoots Karen instead. Abby sees Gary run out of the hotel. She tries to get out of St. Claire’s limo and yells at him to help her. St. Claire pulls her back in and they speed off. Gary runs after the limo. Back inside, the maid is arrested and Mac holds Karen as they wait for an ambulance. NOTE: This is one of the best remembered cliffhangers of “Knots Landing”: Karen is shot by a bullet meant for Gary, and Abby is kidnapped by Mark St. Claire. This is the final appearance of Claudia Lonow as Diana Fairgate leaves for New York. The producers reportedly added the cliffhanger of Karen being shot at the last minute. They originally planned on only having Abby kidnapped but then decided to add more drama by having Karen shot. 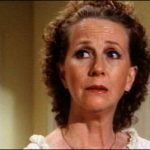 Julie Harris did not appear in this episode.